Location is everything when you are on vacation--we are 1 & 1/2 miles to the Plaza -- you can walk or drive 4 minutes. Having wonderful restaurants, shops, and 200+ wineries all nearby makes for plenty of things to enjoy. Plus the Russian River is an 1/2 mile away -- the swim beach and kayaking add fun to summertime. Healdsburg is a friendly town for everyone to enjoy. Don't miss the Tuesday night free concerts in the Plaza in summertime. Great golf is nearby--we like the public course in Windsor + others in the area. Great weather & lots to do makes this a great place to live and visit. Backdrop of rolling hillsides. 15 acres of gorgeous vineyard views all around the Wine Country Cottage. Take a walk through our vineyards...magical. Charming one-room studio Cottage with living space, kitchenette and Queen bed. Outdoors has wrap around porch and private deck with bbq & dining table and chairs. Kitchenette has small frig, microwave, coffee maker, toaster. Gas BBQ on deck. Dishes and utensils. Dine indoors or on the private deck. Gas bbq. Sound link for your iphone, ipod or ipad so you can enjoy your music. The Cottage is nestled in a beautiful garden. Enjoy strolling through the gardens and relaxing in the rose garden. The view of vineyards from the oak tree is one of Healdsburg's best views! Wrap-around porch and private deck surrounded by flowers and vineyards. Simply gorgeous! Vineyard views ~ 15 acres of private vineyards and beautiful private gardens surround this romantic cottage for two. You are invited to stroll through our private vineyards! Location - 1 & 1/2 miles to Healdsburg Plaza. It's a 20 minute power walk or 3 minutes in the car! Wineries galore - over 200 within 30 minutes. We have Wine Road maps for you! World class restaurants in Healdsburg -- what a great place to enjoy the good life! The property is beautiful and Leighann is great! My girlfriend and I will be back. 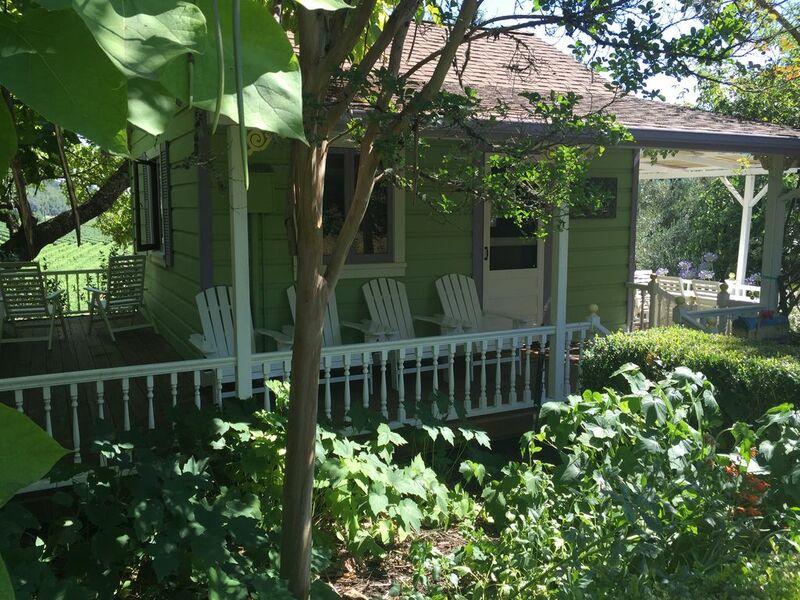 Cute place with a great location - close to the Healdsburg square, but not too close. Beatiful view of vineyards from side porch and adjoining garden. Bed was relatively comfortable but as others mentioned the bathroom is tiny and there is limited lighting (and clothes storage). Just understand that going in and you will enjoy your stay just as much as we did. We thoroughly enjoyed our time at the Nest. It was private and well maintained. We had everything we needed to enjoy our stay there. The grounds are beautiful and we were able to take in the views of the vineyard from one of the vantage points on the porch. The bed was very comfortable and the gas fireplace added a beautiful ambiance. We had a refrigerator and coffee press as well as a microwave, toaster and a grill that allowed us to prepare a few meals We were in close proximity to the center of town which added to the enjoyment of our stay. We highly recommend this beautiful place to others. Wine Tasting at more than 200 wineries within 30 minute of the property. Explore charming Healdsburg Plaza just 3 minutes away--shops, spas & world class restaurants! 1/2 mile to Russian River swim beach, kayak and canoe trips! The sweet spot in Healdsburg is the Plaza -- we are a 3 minute drive away! Our location is perfect -- country but close to everything! Good news...you won't spend a lot of time in your car!